Post centered on the base plate with pre-drilled holes on each side for rails. Post is side offset with no pre-drilled hole on the outside edge. 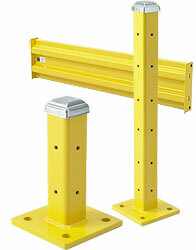 Post is corner offset with no pre-drilled holes on one outside edge.